What is the CAPSULE Program? The CAPSULE program has developed an "ENGINEERING BASED LEARNING" guide for K-12 teachers that are seeking to implement more project-based learning experiences in their classes! Just as an educator provides students with direction at the start of a lesson or activity, this publication is a tool for implementing engineering based learning (EBL) in the classroom. 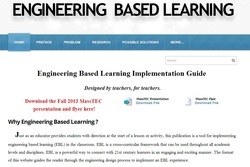 CLICK HERE TO VISIT THE NEW ENGINEERING BASED LEARNING IMPLEMENTATION GUIDE! CAPSULE is a two-week Engineering Project-Based professional development experience for high school science, technology, engineering, and mathematics (STEM) teachers funded by the National Science Foundation. Northeastern University and the Museum of Science in collaboration with the Boston Public Schools invite you to join us this summer in the design and implementation of CAPSULE, providing Capstone experiences for High School Students. Participants will be immersed in a variety of engineering experiences supporting the development of a menu of engineering capstone experiences for the high school classroom. and a typical suburban "no-shops" high school. http://mos.org/orderhandsminds. • Participate in program evaluation activities (several surveys and a focus group). • Graduate credit is available.